One of the great delights in discovering that we're going to have to girl is not just in shopping for extremely adorable clothes. Oh no. It also means adding at least five hundred additional bookshelves to our house (give or take) to add girly titles to our reading repertoire. I still have a lot of my books from when I was growing up, but the large majority of them are classic mystery series, such as Nancy Drew and Trixie Belden. Therefore I've been on the prowl during recent trips to Goodwill and have picked up a few most-definitely-girl books. The first one I found was The Dollhouse Magic which is really ironic if you know me. I didn't really "do" dolls when I was growing up. I remember playing with dolls with friends but never on my own. I'm not really sure why. I have no recollection. But I do care that my daughter would have a happy, innocent girlhood, filled with dolls and dresses and any other princess-y thing she'd like to get into. And who knows the extent that mommy may or may not participate also. I'm willing to start by finding magical books to share with her. The Dollhouse Magic had a promising ring to it. I read it quickly myself one afternoon and it is really a charming story. It is set during the Great Depression and follows the story of two sisters, Lila and Jane. Lila and Jane's father has come on hard times and the happy family makes do on little more than love and money that they scrape together for essentials. The girls befriend an elderly lady named Miss Whitcomb who owns a delightful little dollhouse which she displays from the front window of her home. Miss Whitcomb notices the girls admiring her dollhouse and invites them over one afternoon to see it up close and personal. The three females form a friendship over this dollhouse which is charming, to be sure. The story does have a rather happy-sad ending in that Miss Whitcomb passes away. However, she leaves her dollhouse to two little girls whom she knows will love and cherish this treasure. 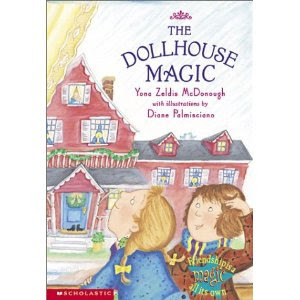 The Dollhouse Magic isn't really about magic, although the title would suggest it. Rather, it is the story of girlhood wonder over a special dollhouse that has been loved for years. It's the story of cross-generational friendship that is particularly meaningful during a period of hard times. It is, in short, a lovely story. I'm glad to have found a copy. If you are going to have dolls, you have to feed them, right? 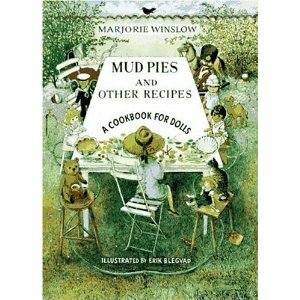 I was equally happy (and amused) to find a copy of Mud Pies and Other Recipes : A Cookbook for Dolls at Goodwill also. (These $0.99 scores are just wow-ing me these days!) Apparently this book was recently re-released in hardback form but I found the paperback copy with the cover art you see displayed here, copyright 1996. This book, however, goes back much further, having first been published in 1961. It is, in a word, adorable. I'm just going to quote from the book because it'll give you an accurate picture of what you can expect to find inside. It continues on . . .
"Doll cookery is not a very exacting art. The time it takes to cook a casserole depends upon how long your dolls are able to sit at a table without falling over. And if a recipe calls for a cupful of something, you can use a measuring cup or a teacup or a buttercup. IT doesn't much matter. What does matter is that you select the best ingredients available, set a fine table, and serve with style." The book is divided up into the following categories: Appetizers, Soups, Salads and Sandwiches, Main Dishes, Pastries and Desserts, Beverages and Suggested Menus. It's a quick and easy read and definitely dated to 1961. That said, it's cute, innocent and tongue-in-cheek. Adults would find the humor in it. Young ladies, I suspect, would take it seriously just as they should. I love it! So now you know my latest passion, obsession and craze: dolls. Who'da thunk it? What fun! I love the titles, had never heard of them, and am chuckling over you collecting a bunch of girl books now! :) Only fellow booklovers will understand this need. M may be 4, but recently I have really been appreciating more feminine things, including BOOKS! Have fun preparing for this little babe! Oh, before we knew we were expecting M we asked Grandpa to build us a bookshelf bc our books were overflowing. By the time he did, we knew we were expecting, and the shelf has been in her room ever since. Then E got his own shelf. Then last year we finally got a bookcase of our own...and asked for it to be big (about 5 feet) instead of the much shorter ones. I didn't play with dolls much, either, growing up. I read a lot. :-). Having girls is fun, though. And now that I have a boy, too, I can definitely say that they are different! Shonya - Haha. =) Thank you for your understanding. Annette W. - I still need to take pictures of all of our bookshelves one day. We just bought some "built in" bookshelves for the downstairs which I'm excited to have finished up. Will help clean up our floors and double-stacked shelves. Great point! I love girlie books! The Mud Pie book sounds really cute!! One of my favorite doll stories is Tasha Tudor's 'Doll's Christmas.' Just captures the magic. I never did dolls growing up either, but I did have a fascination for the super-expensive hobby of dollhouse collectibles. I had a cool dollhouse for a while that I painted and stained and furnished. Someday I want to do that again! Both of those titles sound so cute! I especially love the cookbook! When I was pregnant with my third baby after two boys I said (and believed) that I didn't care what gender it was. In a way, it was true because of course I'd have been happy if it was a boy. But I always knew the thing I'd miss most if I didn't have a girl is sharing certain books. I told my husband that if it was a boy he and the boys were all going to have to one day accompany me to PE Island and the Little House town and just deal with it. But I had a girl as #3 and it's been more fun than I ever thought it would be. She's still too little to enjoy all the favorites of mine but I look forward to that day. You must, must, must buy Big Susan, by Elizabeth Orton Jones. My daughter and I just finished reading this one and it was magic, from start to finish. Congrats on your news. We have a boy and a girl, and as much as I love both - fiercly and equally - I love the girl toys. And girl books.